There’s not a content marketer out there that doesn’t yearn for their work to go viral. Every time we publish a new blog post, infographic, video, or other piece of content, we hope that it catches on, people share it like crazy, and the traffic comes flooding in. Of course, more times than not, this doesn’t happen, but that’s not the real problem. The real problem is most content marketers aren’t even prepared to handle the beautiful chaos that occurs when something actually does go viral, so even if they do hit the jackpot, they’ll likely come away with nothing to show for it because they got in over their heads. Trust me, it’s a lot of fun when you have a viral hit, watching the traffic spike on your website, seeing your content getting shared at lightning speeds in all corners of the web. But take it from someone who has been fortunate enough to earn numerous viral hits, it’s not all fun and games, and you can’t just kick your feet up on your desk and enjoy the ride. The real work begins once your content starts going viral. 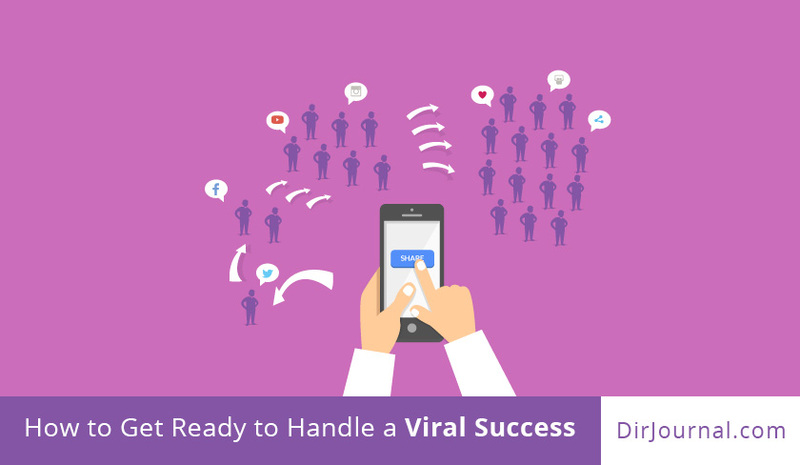 How can you make sure you’re in a position to handle going viral? Here are some key tips to help you out. Get your hosting in order—When you have something go viral, you could see a huge spike in web traffic. I’ve had content hit the front page of Reddit a few times in the past, leading to thousands of people on my site at once. The first time this happened, I wasn’t ready and the site was painfully slow and eventually crashed. This killed our momentum. I had to get on the phone with my hosting company in the midst of the chaos and try to upgrade our plan to handle the traffic. It was a mess. Now, whenever I think we have something that might go viral, I make sure the site is ready to handle the crushing traffic. I’ll usually call my hosting company beforehand and ensure everything looks good to keep the website up and running smoothly should the content take off. Be ready to engage socially—Viral success leads to a ton of people commenting on your content, whether that’s on your blog, on Twitter, on Reddit, or other places. You need to be a part of the conversation if you want your success to stick. Respond to as many comments as you can thoughtfully, interact with people sharing your content on social sites, and do everything you can to keep the conversation going. Why? The longer you can keep the conversation going, the longer the lifespan of that viral spike. And more importantly, engaging with your new audience can lead to them coming back to your site in the future for more great content. Capitalize on your success with great media outreach—When something goes viral, it’s quite likely that you’ll have bloggers and reporters contacting you wanting to cover your story. That’s great, and you need to make sure you’re available to quickly respond to the media to nail down those precious opportunities. But you don’t want to just sit back and wait for reporters to come to you. You need to be proactive and do your own media outreach. Whenever I’m preparing content I think has a chance to go viral, I always create a media outreach strategy. That means identifying all of the reporters I want to personally email about the story and crafting great, personalized pitches that help get their attention. I’m very aggressive, but also highly targeted, when it comes to this reporter outreach, making certain I’m messaging every reporter out there who I think would be a good fit to cover the story and giving them compelling reasons to do so. Being proactive like this has helped my sites get covered in places like Time, Fortune, TechCrunch, Yahoo, and a ton of other great sites. If you follow these simple tips, you’ll be ready to capitalize on the massive benefits of going viral! Eric Brantner is a serial blogpreneur who has started several successful blogs, reaching millions of visitors in the process. He’s just launched his newest site Scribblrs.com where he shares his experience starting blogs and offers tips to new bloggers seeking success.